Large numbers of valuable stalactites are being illicitly appropriated and sold in markets in southwest China's Chongqing, the Chongqing Evening News reported. A large stalactite discarded in a brook. 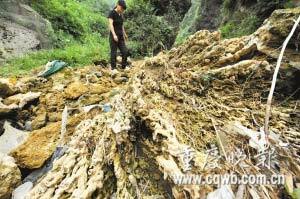 Almost all of 30 shops in the Wanghai Flower Market in Jiangbei District, Chongqing, are selling stalactites. The rocks, with prices starting at 3,000 and rising to as much as 36,000 yuan, are largely being brought here from various limestone caves in the locality. "Due to this exploitation, almost all of the large limestone caves in the area around the city are riddled with scars," said Wang Dayong, leader of the Chongqing Outdoor Caving Team, which spends significant amounts of time in the caves. "We have visited hundreds of caves; wherever the stalactites are accessible they have been knocked off." Qibaoshan Karst Cave is just one of the victims. Deng Youji, a local coal boss, had planned to invest a large sum of money to develop it into a new sightseeing spot in Dazu County. They inspected the cave in the first half of the year, but unexpectedly found one third of the stalactites had been stolen, with broken stalactites randomly scattered around. Deng had no choice but to abandon his plan. The famous Zhangguan Karst Cave in Yubei District is another to have fallen victim to this fate. Security guards now man the entrance and exit to prevent the situation from deteriorating further, and the iron gates are closed in the evening. Nonetheless, some people still walk off with stalactites, according to the scenic spot office. Old Wang from Qijiang County has been making a living from stalactites since 2004. His fantastic stones largely come from Nanping Township, Nanchuan District, which is typical of the area's karst topography. He quarries stalactites by breaking them off with a sledgehammer. Falling to the ground, they inevitably break into pieces. Old Wang will bring these pieces back home and restore them with cement and granite. Their surfaces painted in khaki, they will become an element of stalactite rockeries. It appears that the stalactites priced at 3,000 to 4,000 yuan are largely sourced in this way. The buying market has dictated that only an intact stalactite will fetch a higher price. In order to target this end of the market, Old Chen from Banzhu Village, Pulu Township adopts more brutal means. He uses heavy-duty equipment such as a rooter and a crane to excavate a cave from top to bottom, and hence cleans up every stalactite whole. The stalactite priced at 36,000 yuan is exhibited in his shop. It is estimated that the illicit exploitation operates at a very low cost, with labor spending of 100 yuan per ton and a transportation fee of 50 yuan per ton, while the sales price is around 1,000 yuan per ton. Wu Dengming, an environment expert, observes that the stalactites can form a distinctive microbial environment and hence provide support to a variety of species. If they are destroyed, the microecology will be affected, and the damage to the mountain may even cause geological problems.